The second V-Mail Postcard Game, UNTERNEHMUNG 25, chronicles the Axis invasion of Yugoslavia in 1941. The basic game system is similar to the of its predecessor, Malaya. New elements include German mountain troops, Panzer Corps, air support, and the bombing of Belgrade, as well as the effects of mountain and river terrain. Hungarian and Italian troops also make an appearance. Can you, as the Germans, make a lightning-fast assault and capture Belgrade in time to release units for the upcoming invasion of Russia? As the Yugoslavs, can you derail the German timetable and buy time for the Allies to react? It's all up to you. 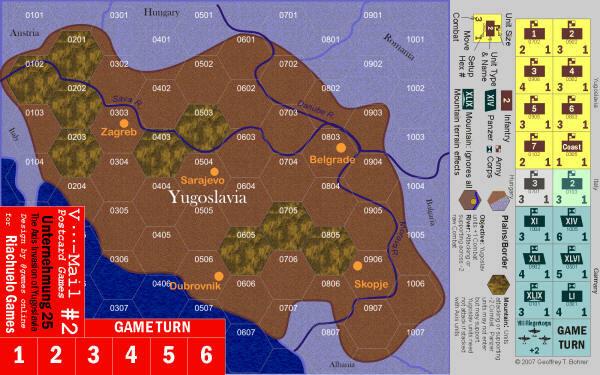 18 counters at the Corps and Army level and a full-color map of Yugoslavia- all on a 5x8 inch postcard! JT McNally 10 10 10 Love those postcard games! And free, can	beat it! ED Donahue 5 10 8 love the concept of small and simple one sheet games. Peter Ander 8 8 6 For an extremely simple and uncomplicated wargame, I am impressed. Finding a "Take anywhere and play it on a whim" type game is next to impossible anymore. Steve Jackson Games, and their ilk from the 1970's have left this opportunity behind. Olof Rautavaara 10 10 10 Nice little game, more interesting rules like air power and mountain troops. Jeremy Ward 9 10 9 Great game for a one pager, good components as well. Luuc Lubbers 7 8 8 I found it better than VM1, but still was very hard for the yogoslav units to keep hold of an objective. Rob Arcangeli 10 8 9 Very good postcard game, it has an in-built bias to the Axis forces but that is to be expected. I find it a great game to play through twice, swapping sides for each game. WEI-CHENG CHENG 6 5 5 The second volume in the postcard series. This one has better counter artwork and was modified a little bit. It is still a good game and has historical setting. John Tea 10 7 8 Fun and entertaining postcard game. E C 10 10 10 AWESOME! Alberto Scaccianoce 9 6 8 A nice little wargame, useful to learn some basic concept. A bit too hard for the Yugoslavian, though. john conner 10 9 10 A great small wargame excellent for noobs. Marco Parolo 9 8 6 Muy interesante aunque no soy un gran jugador de wargames, me gsuto. Forest Pavel 10 8 9 Just like the Malaya game you can't beat the price and the ability to have a game at hand no matter where you are. JOSE DINIZ 5 6 6 Good game. Small, fast and intense. Thanks for wargamedownloads !